What is it about bears that makes them so utterly endearing, especially in picture books? Archie loves bears, too. In fact, Archie thinks he is a bear, although to most people he just looks like a boy in a bear suit. Fed up with having to explain himself to people, Archie leaves home and heads to the forest, armed with his bear sack and some honey sandwiches. In the forest, he meets a real-life bear, although the bear thinks he is a boy. Finally, Archie has met someone who understands and so the pair strike up a friendship, doing all sorts of bear and boy things, like reading stories, fishing and collecting honey. 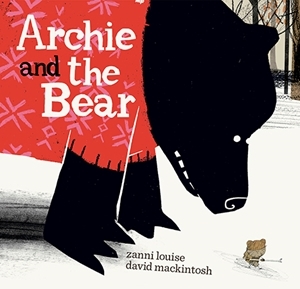 Zanni Louise has an incredible ability to step inside the mind of a child and here she captures the lovable, stubborn voice of a strong-willed boy swept away by his own imagination. The text is funny, offbeat and pure joy to read out loud. It's perfectly matched with David Mackintosh's illustrations. As always, Mackintosh - with his glorious blend of texture, sketches, watercolour and even silhouette - will leave readers awestruck. A unique balance of colour and white space, along with a distinctive use of angles, makes each page shine with charm and whimsy. Quirky, humorous and poignant, this is a tale about being true to oneself.